I don’t know anyone who couldn’t use a little boost in their energy and self-control. Researchers at the University of Nottingham recently published findings from their exploration of 83 separate studies on energy and self-control. What they found will change the way you start your day. The researchers found that self-control and energy are not only intricately linked but also finite, daily resources that tire much like a muscle. Even though we don’t always realize it, as the day goes on, we have increased difficulty exerting self-control and focusing on our work. As self-control wears out, we feel tired and find tasks to be more difficult and our mood sours. This exhaustion of self-control kills your productivity, and it makes the morning hours, when self-control is highest, the most important hours of the day. But the trick isn’t just to spend your morning hours working; it’s to do the right things in the morning that will make your energy and self-control last as long as possible. The Nottingham research has led me to uncover ways we can break bad habits in the morning and maximize our energy and self-control throughout the day. Whether you naturally wake up feeling alert and productive or wake up with the brainpower of a zombie, these tips will help you transform your morning routine and set a positive tone that lasts the entire day. Researchers at the University of Bristol found that people who exercise during the workday have more energy and a more positive outlook, which are both critical to getting things done. Getting your body moving for as little as 10 minutes releases GABA, a neurotransmitter that makes your brain feel soothed and keeps you in control of your impulses. Exercising first thing in the morning ensures that you’ll have the time for it, and it improves your self-control and energy levels all day long. Drinking lemon water as soon as you wake up spikes your energy levels physically and mentally. Lemon water gives you steady, natural energy that lasts the length of the day by improving nutrient absorption in your stomach. You need to drink it first thing in the morning (on an empty stomach) to ensure full absorption. You should also wait 15–30 minutes after drinking it before eating (perfect time to squeeze in some exercise). Lemons are packed with nutrients; they’re chock full of potassium, vitamin C and antioxidants. If you’re under 150 pounds, drink the juice of half a lemon (a full lemon if you’re over 150 pounds). Don’t drink the juice without water because it’s hard on your teeth. When you dive straight into e-mails, texts and Facebook, you lose focus and your morning succumbs to the wants and needs of other people. It’s much healthier to take those precious first moments of the day to do something relaxing that sets a calm, positive tone for your day. Jumping right into electronics has the opposite effect -- it’s a frantic way to start your day. Exercising, meditating or even watching the birds out the window are all great ways to start the day. Eating anything at all for breakfast puts you ahead of a lot of people. 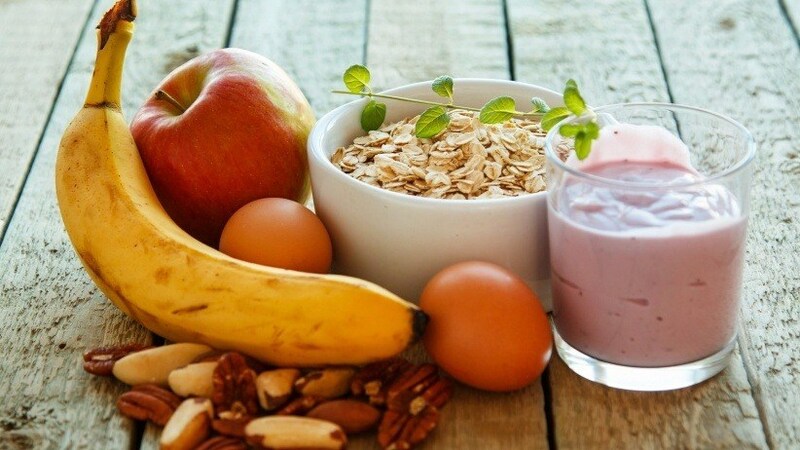 People who eat breakfast are less likely to be obese, they have more stable blood-sugar levels and they tend to be less hungry over the course of the day. And these are just the statistics for people who eat any breakfast. When you eat a healthy breakfast, the doors to a productive day swing wide open. A healthy breakfast gives you energy, improves your short-term memory and helps you to concentrate more intensely and for longer periods. Research shows that having concrete goals is correlated with huge increases in confidence and feelings of control. Setting goals specific to the day puts everything into motion. Narrow your goals down to a few achievable ones that can easily be broken down into steps. Vague goals such as “I want to finish writing my article” are counter-productive because they fail to include the “how” of things. The same goal re-phrased in a more functional way would read something like this: “I am going to finish my article by writing each of the three sections, spending no more than an hour on each section.” Now, you have more than simply something you want to achieve -- you have a way to achieve it. Even though it’s a pain to clean right when you get into work, it makes a big difference to your ability to concentrate. A Princeton University study found that people who worked in a clean workspace out-performed those who worked in a cluttered one because clutter pulls your attention away from your work. In fact, the effects of clutter on concentration are not all that different from the effects of multi-tasking. “Eating a frog” is the greatest antidote to procrastination, and the most productive people know the importance of biting into this delicacy first thing in the morning. In other words, spend your morning on something that requires a high level of concentration that you don’t want to do, and you’ll get it done in short order. Make a habit of eating three frogs before you check your e-mail because e-mail is a major distraction that enables procrastination and wastes precious mental energy. Meetings are the biggest time waster there is, and they can ruin an otherwise productive morning. People who use their mornings effectively know that a meeting will drag on forever if they let it, so they inform everyone at the onset that they’ll stick to the intended schedule. This sets a limit that motivates everyone to be more focused and efficient. Keep your morning meetings on time, and your entire day will stay on track. Multi-tasking in the morning -- when you have lots to do, tons of energy and it feels like you can do two or three things at once -- is tempting, but it sets your whole day back. Research conducted at Stanford University confirmed that multitasking is less productive than doing a single thing at a time. The researchers found that people who are regularly bombarded with several streams of electronic information cannot pay attention, recall information or switch from one job to another as well as those who complete one task at a time. But what if some people have a special gift for multitasking? The Stanford researchers compared groups of people based on their tendency to multitask and their belief that it helps their performance. They found that heavy multitaskers (those who multitask a lot and feel that it boosts their performance) were actually worse at multitasking than those who like to do a single thing at a time. The frequent multitaskers performed worse because they had more trouble organizing their thoughts and filtering out irrelevant information, and they were slower at switching from one task to another. Ouch! Multitasking reduces your efficiency and performance because your brain can only focus adequately on one thing at a time. When you try to do two things at once, your brain lacks the capacity to perform both tasks successfully. No is a powerful word that will protect your precious mornings. When it’s time to say no, avoid phrases such as “I don’t think I can” or “I’m not certain.” Saying no to a new commitment honors your existing commitments and gives you the opportunity to successfully fulfill them while your mind is fresh. Research conducted at the University of California Berkeley showed that the more difficulty that you have saying no, the more likely you are to experience stress, burnout, and even depression. Learn to use no, and it will lift your mood as well as your productivity. The right morning routine can make your day, every day. The trick is to be intentional about your mornings, understanding that a.m. hours are precious and should be handled with care.